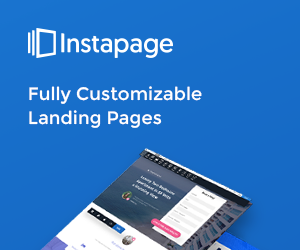 Instapage is one of the most powerful tools you can have when it comes to building landing pages. There is no shortage of landing page and webpage builders for WordPress. Many are free and some have paid or premium versions as well. Given the fact Instapage is not free, albeit there is a free trial, it does have many more features than free open source solutions. Hence, it is definitely better than most WordPress webpage or landing page builders. Instapage is easy, even for amateurs, and the features are useful and convenient to explore. Everything from A/B testing to the actual designing is well organized and free of fluff, and you can have well optimized, efficient and effective landing pages for all your websites. Before we delve into our comprehensive Instapage review, let us quickly check out the strengths and shortcomings of this software. Instapage drag and drop builder is one of the simplest versions of the concept. It is an authentic drag and drop builder without any constrains, and it is easy to use. There is a vast inventory of templates and most of them are better than your average fare. A/B testing is easy, the analytics are insightful, conversion goals are definitely convenient to work with, there are plenty of integrations with third party tools including major email marketing services and you can work on your mobile website as well as operate lead magnets through the system. There are no shortcomings when you consider the features or what Instapage can do but one may complain about the price. You must subscribe in order to access all of the features. The starter plan is obviously the cheapest but it doesn’t have A/B split-testing. Issues such as these may be off-putting for beginners, especially those who are yet to optimally monetize their websites. Professionals, be it marketers, affiliates or agencies, will not have any issue with the Instapage pricing. Those who work on landing pages all day and spend every moment of their workday trying to deal with challenges of the digital world will appreciate the features and functionalities of Instapage. Like any other paid software, Instapage too has had several upgrades over the years. Recent updates include heat maps, audit log and edge measurement. The extensive features of Instapage can be categorized into Instapage Builder, Design, Lead Capture, Optimization, Integrations & Publishing, Team & Agency Management, Security & Support and Enterprise. Instapage Builder is widely believed to be the best landing page building tool in the industry You get customizable Instapage templates, mobile responsive designs, custom code editing, widgets, image manager, confirmation pages and history of page versions. In Design you can work on grouping, alignment and distribution, there is a Bigstock image library and custom fonts of Google and Typekit, parallax scrolling, Axis Lock and hotkeys or keyboard shortcuts. You can work on Lead Capture with form builder that can create forms with multiple steps or fields, there are lead routing and lead notifications, lead backups, digital asset delivery, personalized confirmation messages, opt-in forms and pop-ups with exit intent or lead capture forms. The Optimization section comes with unlimited split testing, pixel tracking, tag manager, dynamic text replacement, page grouping and real time reports. Integrations & Publishing features include an overview of integration and publishing, you can publish to as many domains as you want and you can publish using custom domains, WordPress or Drupal. You can work on Team & Agency Management with integrated collaboration solution, advanced permissions for private subaccounts ensuring security and privacy, multiple users and you also get the luxury to choose team members who can only access information but not alter it. There is 24/7 customer support through email and chat. You get SSL certification. Instapage facilitates fast loading pages and guarantees server uptime. There are global data centers, customizable plans, dedicated relationship manager for Enterprise subscribers, migration services advertising attribution solution, expert design reviews, Google AdWords and Analytics, various professional services and support via phone. Instapage is rich in features and functionality. It is a reliable solution that’s easy to use with support you can actually count on. The drag and drop page builder, widgets, customizable templates, thirty three million images via Bigstock, form builder, asset delivery, analytics and collaboration tools are the most noteworthy benefits of using Instapage. You could assess Instapage vs. Leadpages or Instapage vs. Unbounce and you would still be impressed with the features of Instapage. The fact that Instapage WordPress integration works seamlessly and is such a robust setup that most developers naturally move towards the solution when they want to have world class landing pages for their websites. You can try Instapage for free. There is a 14-day free trial wherein you get all the features of paid plans other than the Enterprise plan which is a customized proposition. You don’t need to provide your credit card or any other financial detail to access the free trial, so it is a completely nonobligatory offer. Should you be happy, you can consider the Core plan for $68/month when billed yearly or you can pay $76 in a pay as you go month to month arrangement. The Core plan gets you real time collaboration, more than twenty integrations and pixel perfect design. The Optimizer plan is for $113/month or $126/month depending on billing. You get all aforementioned features and unlimited split testing, heat maps and dynamic text replacement. Team & Agency plan costs $203/month or $225/month in pay as you go scenario. You get all features in the Optimizer plan and fifteen private subaccounts, audit log and branded lead notifications. Enterprise plan is the custom plan that the developers will personalize for a company or agency, it is not really necessary for individuals. The will have several advanced functionalities catering to unique requirements of the agency or company. All features of all other plans will obviously be available. The highlight would be the relationship manager and other professional services. Instapage is great. But ClickFunnels is better. ClickFunnels puts more features at your fingertips. It runs smoother than Instapage. It is easier to use than Instapage, and it has more features and tools to offer. Every feature that you are looking for in Instapage is both present and better in ClickFunnels. Copyright © 2018 - Disclosure: We receive compensation from the companies whose products and services we recommend.